Hot Tub Outpost carries discount quality hot tub steps for your portable indoor or outdoor spa. Entry steps make getting into and out of your hot tub a breeze. 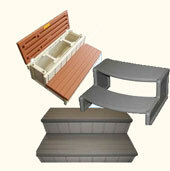 Hot Tub Outpost offers the most durable redwood and gray color hot tub steps in 28", 36" and 72" widths. Some even have a storage compartment underneath the upper step - perfect for keeping your spa chemicals. All of our spa steps are portable, slip resistant and easy to clean. Most steps come fully assembled or snap together easily. We also carry a selection of hot tub rails and bar sets with stools. Orders over $95 ship for FREE!